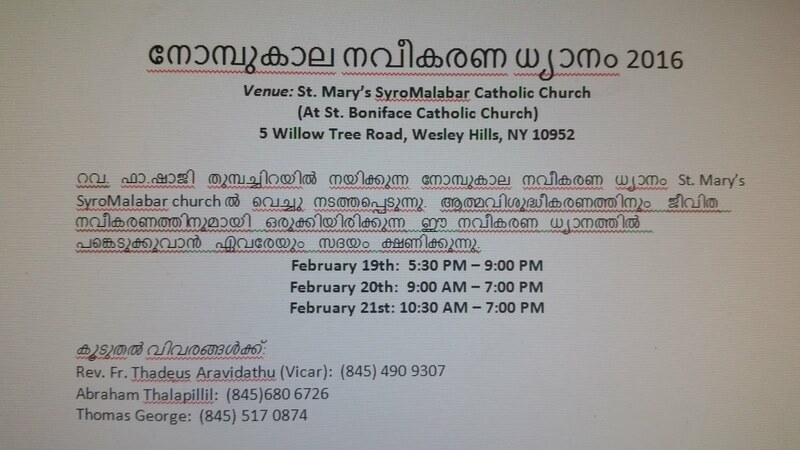 This month we will have Holy hour ( Eucharistic Adoration) instead of night vigil. 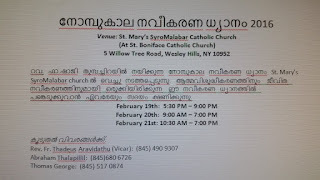 As mentioned in the church calendar, it will be following Mass and Novena. Due to the heavy snow storm, for your safety, it is not advisable to drive around. Therefore, we will not have Mass this morning at 9.00 am. 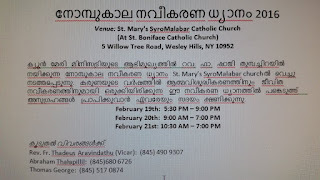 Mary Matha Malayalam School will be closed tomorrow due to the severe weather forecasts. Thanks. Valentines day Parents out and Kids movie night. 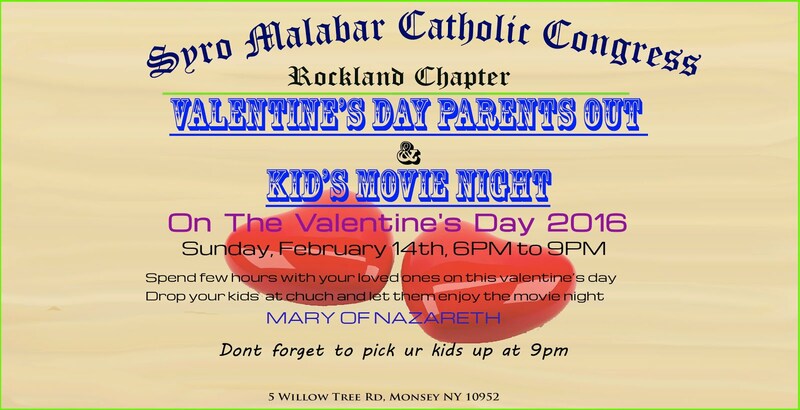 SMCC Rockland chapter is conducting the kids movie night on Valentine's day(Feb 14th-2016; 6.00pm to 9.00pm) , in order to help hard working parents to go out and spent time with each other. We will entertain kids with movie and their favorite foods. No registration is needed for this free event Please see the attached flyer. Our annual (2015) contribution statements are ready; if you are not received by mail, it will be available at help desk after mass on Sunday 1/17/2016. Kids Club is searching for talented youth who know how to play musical instruments. We are looking for any child who is currently studying in 5th grade or up with a minimum of 3 years of experience in playing any musical instrument. Children should have the instrument in their possession. Children who are renting or own an instrument are eligible to sign-up. 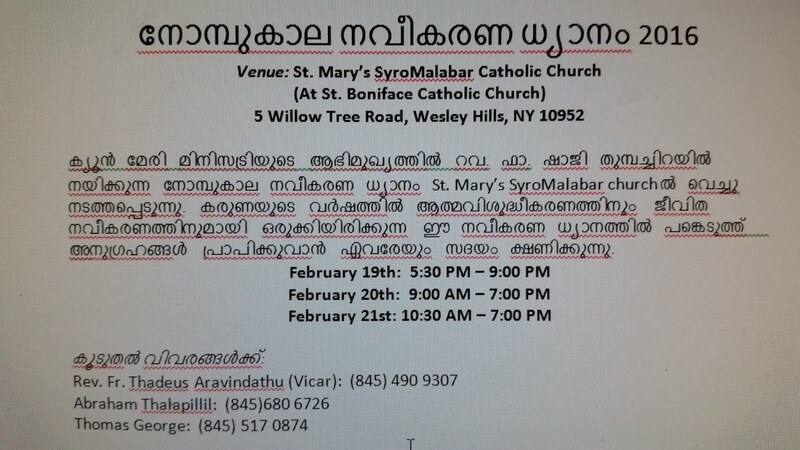 Kids Club is planning to form a Marching band and an Orchestra under our church banner. Qualified teachers and band masters will be arranged to give classes. A nominal fee will be charged. Interested parents may sign-up their children next Sunday at the help desk. Pravasi Channel will telecast our 2016 Family and Friends Night programs as 'Pravasi Channel News' on Saturday January 9th at 12 noon and full program on Sunday January 24th at 3:00 pm. Please watch/record the programs. The cafeteria will be closed at 5 pm (after the social hours). Please make sure be on time with your tickets.